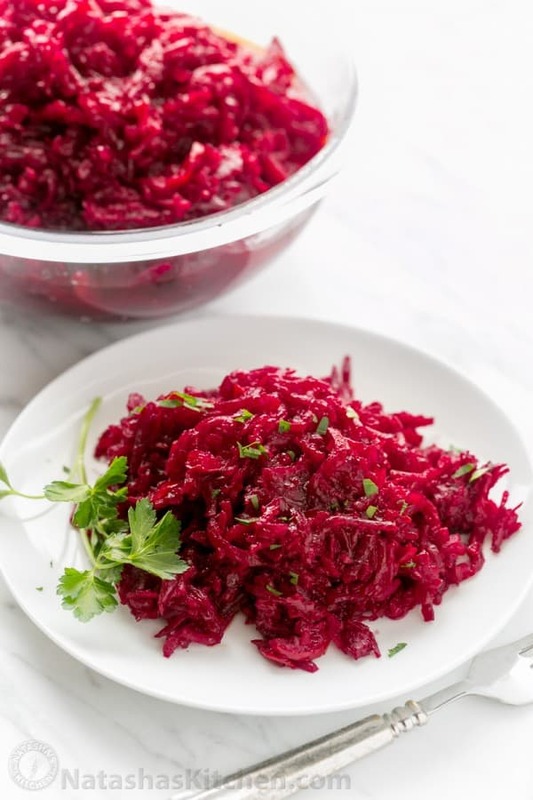 This beet salad is loaded with 3 pounds of beets (super healthy) and the marinade gives it wonderful flavor – you’ll want seconds. 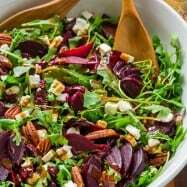 This beet salad is perfect for parties because it’s a make-ahead salad that stores really well in the refrigerator and you can easily double the recipe and can it. 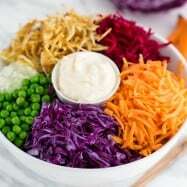 The story behind this salad: My sister, Anna, came home one day from dinner at her mom-in-laws and was going on and on about this salad she had tried. Ofcourse, I called and asked for the recipe. Galina, her Mom-in-law is a brilliant cook. One of the most popular recipes we’ve shared on our blog, is from Galina as well as this scrumptious kale salad. Thank you Galina for generously sharing your recipes with us and making the world a yummier place :). 1. 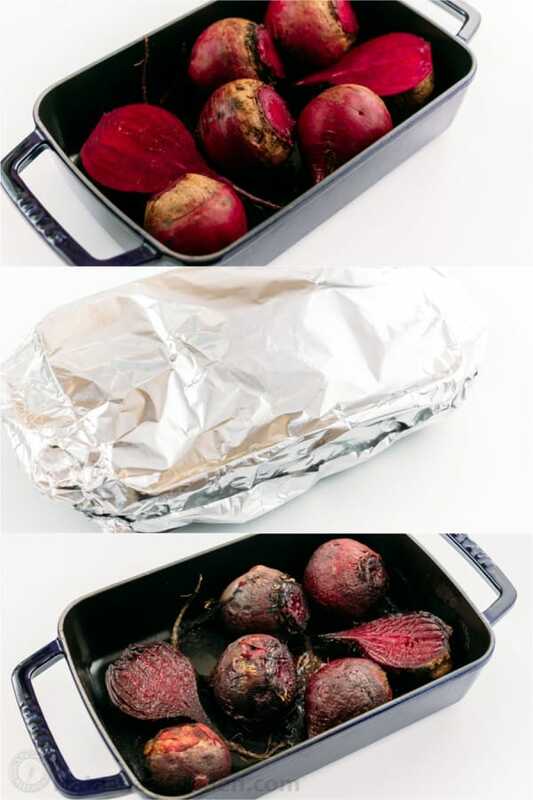 Place beets in a baking dish, cover with foil and bake at 400˚F for 2 hours. I cut my largest beet in half for even baking. 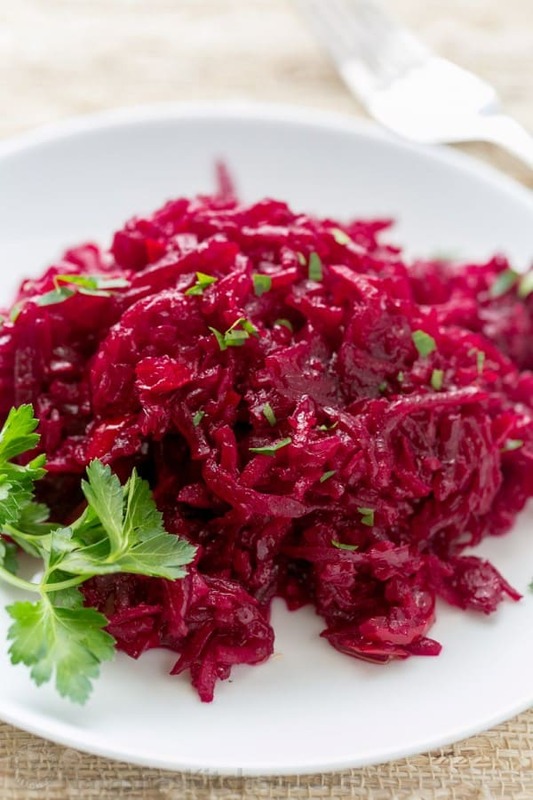 Beets do not have to be completely cooked through, but firm tender. Once beets are cool enough to handle, use gloves and rub beets to remove the skin – it should come off easily. Grate beets on the large holes of a grater (p.s. this food processor makes it REALLY easy). 2. Grate carrots, slice bell pepper and chop onions and tomatoes. 3. 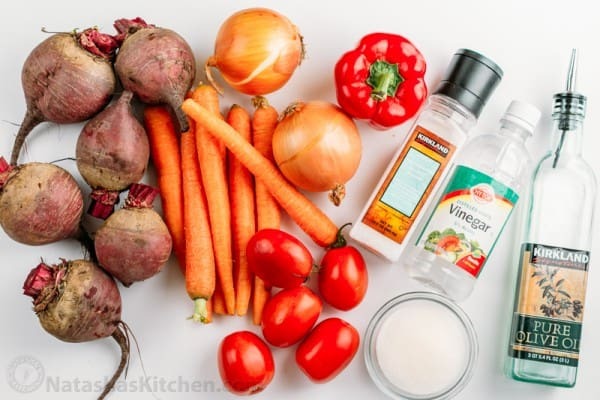 Put marinade ingredients into a large soup pot and bring marinade to a boil. 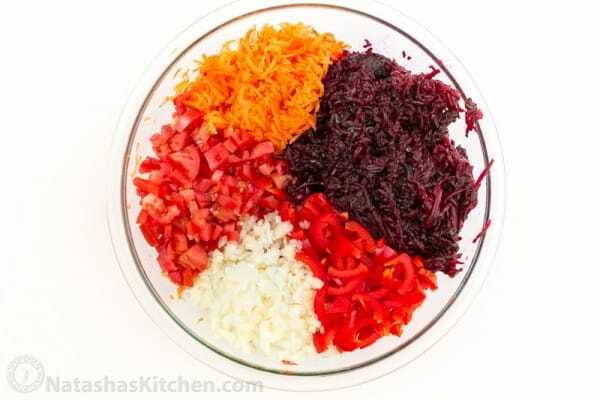 Add all prepared vegetables including beets to the pot and simmer partially covered 50 minutes, stirring occasionally. Do not completely cover with lid since the vinegar needs to evaporate out as it cooks. When done, vegetables will be soft. 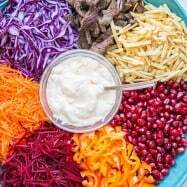 Cool salad to room temperature then refrigerate until ready to serve. 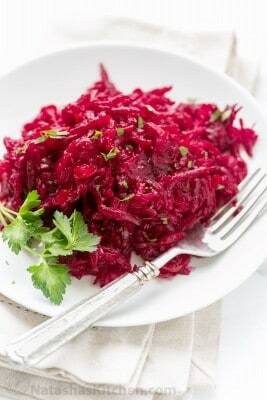 This beet salad is loaded with 3 pounds of beets (super healthy) and the marinade gives it wonderful flavor. 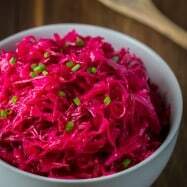 It's perfect for parties because it's a make-ahead salad that stores really well in the refrigerator, plus you can easily double the recipe and can it. Grate carrots, slice bell pepper and chop onions and tomatoes. Put marinade ingredients into a large soup pot and bring marinade to a boil. 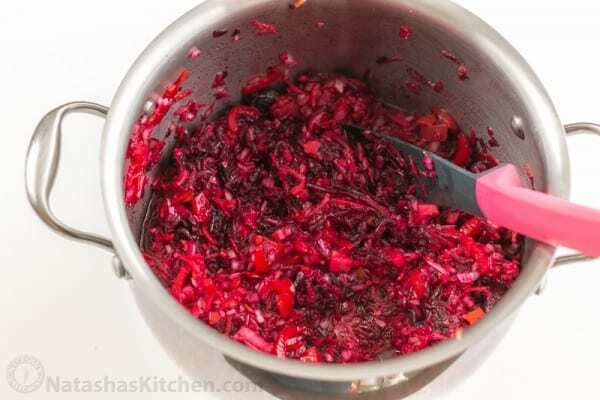 Add all prepared vegetables including beets to the pot and simmer partially covered 50 min, stirring occasionally. 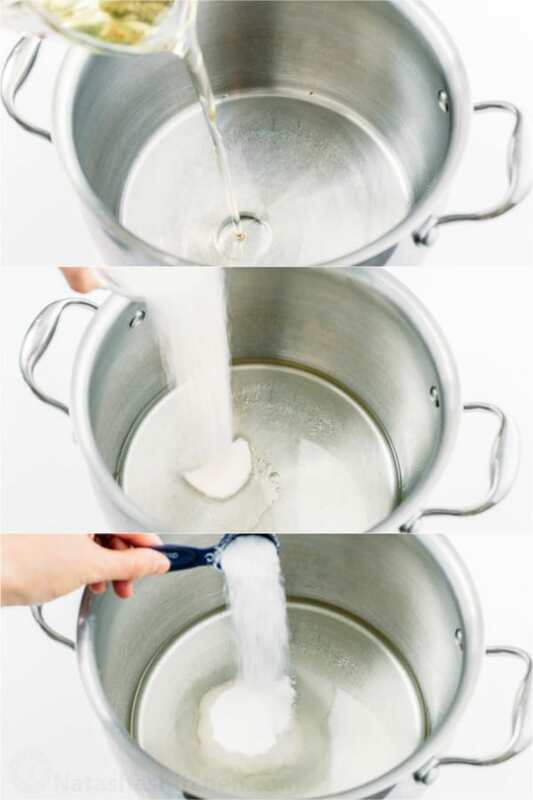 Do not fully cover with lid since the vinegar needs to evaporate out as it cooks. When done, vegetables will be soft. 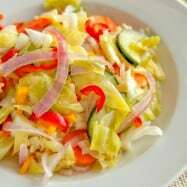 Cool salad to room temperature then refrigerate until ready to serve. 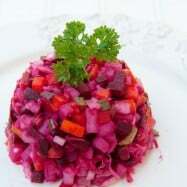 Natasha: I made beet salad this afternoon – it’s beautiful and delicious too. I’ll bring it all to church tomorrow for the coffee hour after liturgy – it will disappear fast. We are still in Lent so it’s perfect.